Most iOS users make use of iCloud in order to back up their important files, and it is very convenient to restore the files back to iPhone when we need the files we backed up. 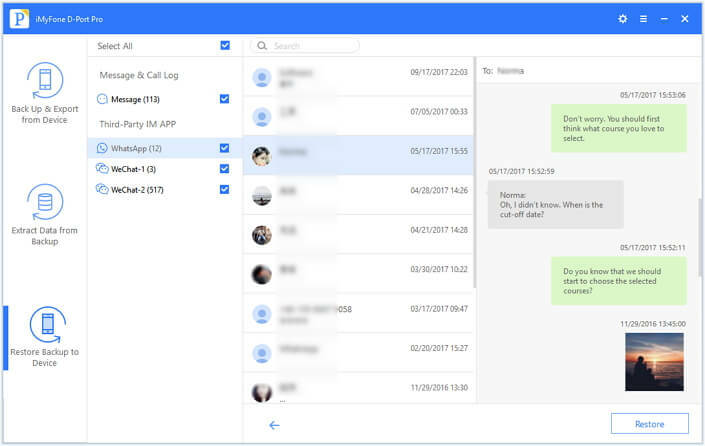 However, most of us want to restore only some particular files from time to time depending on their usability to us or the storage space available on our phone. Restoring the entire backup is also time-consuming for a large volume of data. 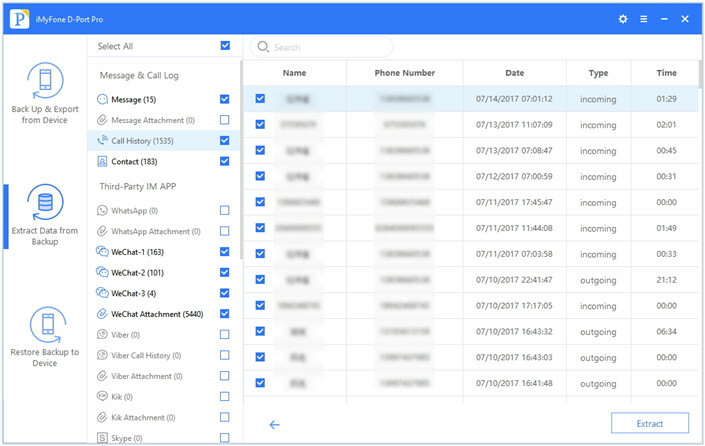 So, we bring you this article with detailed steps on how to restore an individual app data from iCloud backup. If you want to restore individual app data from iTunes backup, please check this article. 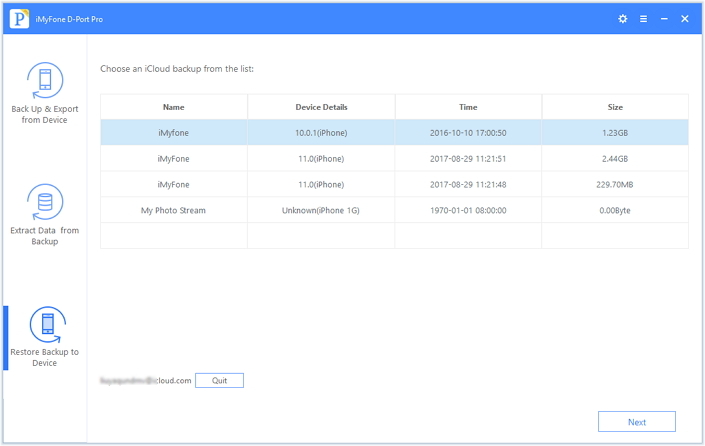 When it comes to restoring individual app data from iCloud backup in an effective way, iMyFone D-Port Pro comes in handy. This desktop based tool is compatible with both Mac and Windows systems. The best part about this tool is that it gives users the flexiblity to restore the backup selectively. You can easily restore WhatsApp, WeChat or Messages if you want. The team is working for its newest version where you will be allowed to separately restore more file types. This tool can extract 20+ types of data from iTunes, iCloud or iMyFone D-Port Pro backup as well. Moreover, no overwriting thing will bother you while working with this tool. 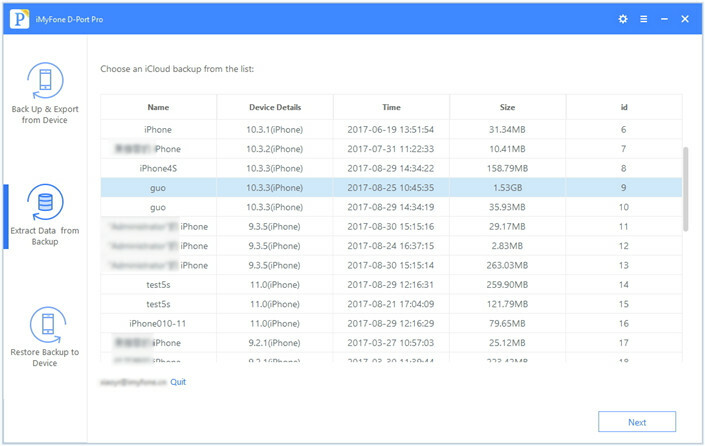 Let us now learn how you can restore an individual app data from iCloud backup using iMyFone D-Port Pro. Download the appropriate version of iMyFone D-Port Pro and launch it on your computer. After this, choose 'Restore Backup to Device'. In case, you do not find the backup you want to restore, click on the hyperlink 'Download iCloud Backup' present under the list of backup. You will now need to follow the instructions as shown on your screen to proceed. Next, you need to log into your iCloud account by entering your credentials. 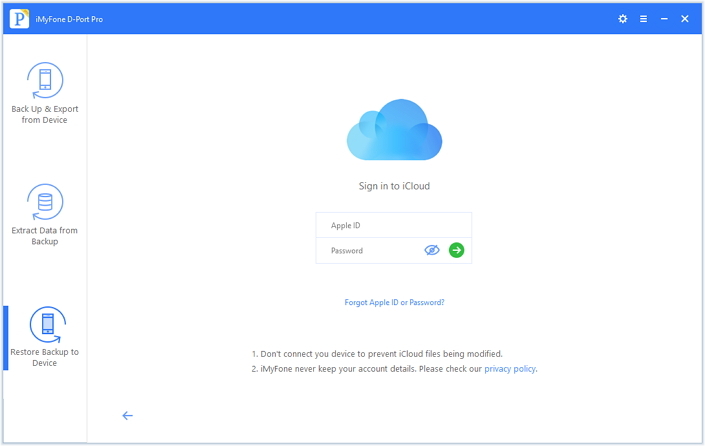 You need not worry about privacy since iMyFone does not keep any record of your iCloud account details. The screen will now be displayed with the iCloud backups. Select the backup file of your choice and click 'Next' to select to data type you wish to restore. Click on 'Next' again to start downloading and scanning the iCloud backup. 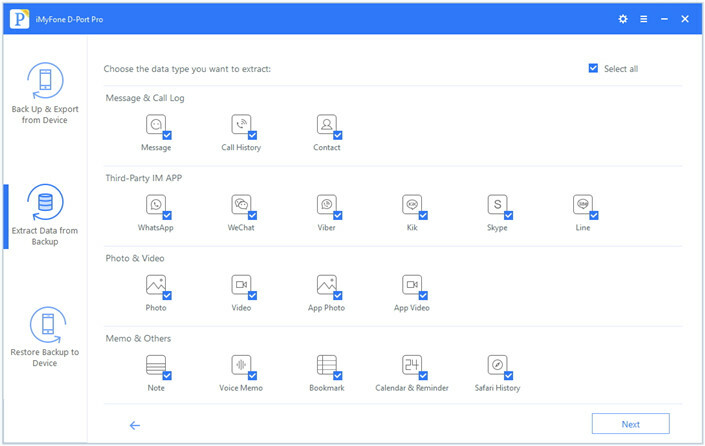 You can now preview the data in the backup and choose the one you wish to restore by clicking on 'Restore'. The data will be restored on your iOS device within a few minutes. With iMyFone D-Port Pro, it is also possible to selectively extract any individual app data from iCloud backup and store it on your computer. These steps shall help you to do that. Open iMyFone D-Port Pro on your computer and select 'Extract Data from Backup'. From it, choose 'Download iCloud Backup'. You will now need to log into your iCloud Account. The list of backup files present in your iCloud account can now be viewed on your screen. All you need to do now is to select the particular file where the desired contents are included. Once done selecting, hit 'Next'. From the next screen, choose the file type you would like to extract. Simply check the box next to the type and click on 'Next' to get it scanned. After the program completes the scanning, you can preview your data that iCloud backup file contains and thereafter choose the items you want to export. After choosing your preference, click 'Extract'. The data gets saved on your computer now. WhatsApp is the only app that allows Apple users to create its individual backup on iCloud without using any third-party application. 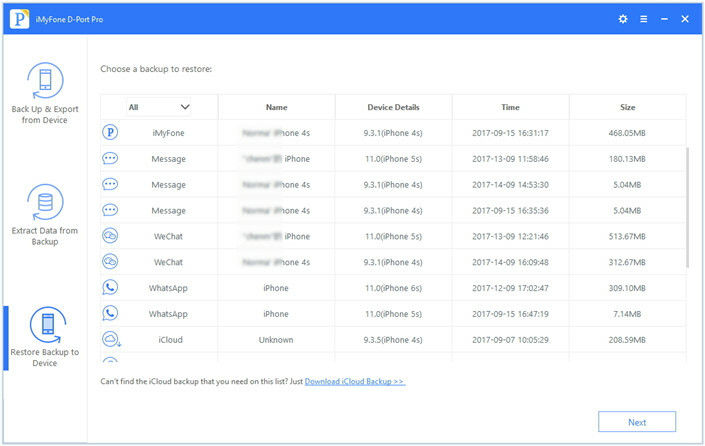 Below we have mentioned how to backup WhatsApp on iCloud and also how to restore individual app data from iCloud backup. If you have done an WhatsApp backup before, you can just jump to the step 2. Open WhatsApp on your iOS device and tap on 'Settings'. From the Settings menu choose 'Chat Settings' followed by 'Chat Backup'. Now, you can view how WhatsApp is linked with iCloud. 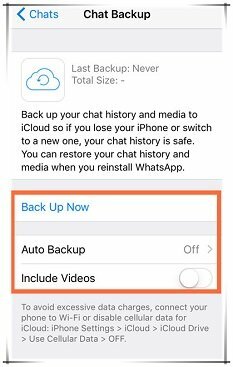 To start backing up your WhatsApp to iCloud, tap 'Back up Now'. When you are done backing up your WhatsApp chats on iCloud, uninstall WhatsApp and reinstall it on the iPhone that you want to restore the backup to. Log into your account by entering the same number as that of the account from which you created a backup on iCloud. After being verified, you will receive a notification to restore your chats. To do so, tap 'Restore Chat History'.